Asparagus has some dietary fiber, vitamin A, and vitamin C. It’s an outstanding source of the B vitamin folate. 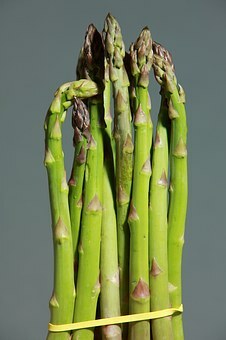 A serving of six cooked fresh asparagus spears has 1 g dietary fiber, 490 IU vitamin A, 10 mg vitamin C and 131 mcg folate. Besides, it’s also low in sodium, fat and practically no cholesterol. Canned asparagus may have less than half the nutrients found in freshly cooked spears. As such it is encouraged to take asparagus when it’s fresh. Search for bright green stalks while buying asparagus. The tips should be purplish and tightly closed and the stalks ought to be firm. Asparagus is in season from March through August. When storing, keep it fresh in the fridge. To keep it as crisp as possible, wrap it in a moist paper towel and then put the entire package into a plastic bag. Keeping asparagus cool helps it to hold onto its vitamins. At 32 degrees F, asparagus will keep all its folic acid for at least 2 weeks and nearly 90 percent of its vitamin C for up to five days. At room temperature, it would lose up to 75 percent of its folic acid in 3 days and 50 percent of the vitamin C in 24 hours. The adverse effects associated with asparagus is that after eating, we’ll excrete the sulfur compound methyl mercaptan, a smelly waste product, in our urine. Eating asparagus may also interfere with the efficacy of anticoagulants whose job is to thin blood and dissolve clots because asparagus is high in vitamin K, a vitamin produced naturally by bacteria in our intestines, an adequate source of which enables blood to clot normally. The white portion of the fresh green asparagus stem is woody and tasteless, so it is possible to bend the stalk and snap it right at the line where the green starts to turn white. If the skin is extremely thick, peel it, but save the parings for soup stock. What happens when we cook asparagus? Chlorophyll, the pigment that makes green vegetables green, is sensitive to acids. When we heat asparagus, its chlorophyll will react chemically with acids in the asparagus or in the cooking water to form pheophytin, which is brown. Because of this, cooked asparagus is olive-drab. We can prevent this chemical reaction by cooking the asparagus so fast that there is no time for the chlorophyll to react with acids, or by cooking it in a great deal of water which will dilute the acids, or by leaving the lid off the pot so the volatile acids may float into the air.